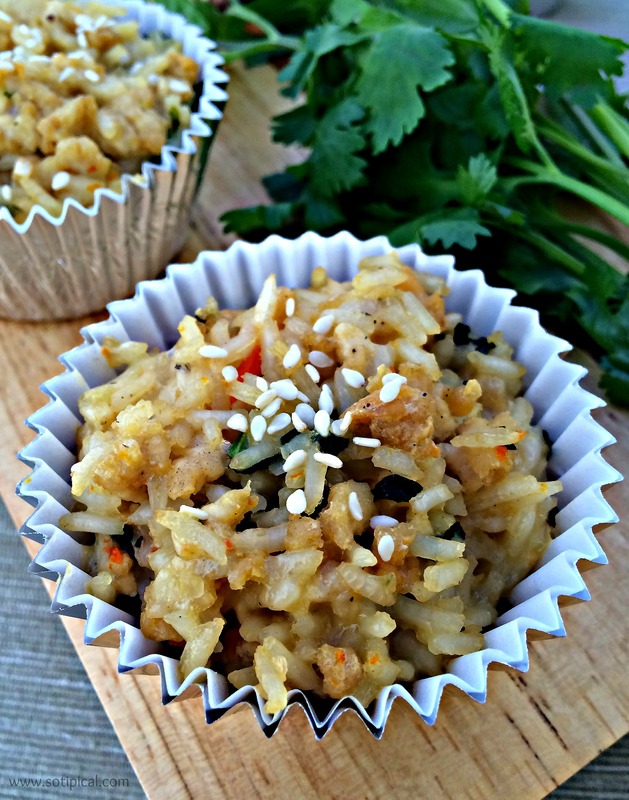 Chicken Fried Rice Cups are my new go-to quick meal and snack for my on the go family! Perfect for lunch boxes or after school snacks! Easy to make, tasty and has protein! What more could you ask for? I’ve mentioned before that my kids don’t really like sandwiches. (Or any breakfast foods!) I know they must sound picky, but honestly, they are fantastic eaters! Most days they bring big salads for lunch, but that even gets boring now and then. They are also involved with activities that require them to fuel up beforehand. I am constantly on the lookout for food options that have all the basics – protein, veggies and a starch, preferably gluten free. I was browsing Pinterest for ideas and saw a few ideas like mini pot pies, quiche cups, lasagna cups, all made in a muffin tin. None jumped out at me as something my kids would want to eat or that would hold well in a lunch box, but I liked the idea of the individual servings. A week or so later, one of them made a portion of fried rice with some leftovers we had in the fridge and it gave me the idea to try it in single portions. Here is how I made it. Next it was time to chop the veggies of your choice. 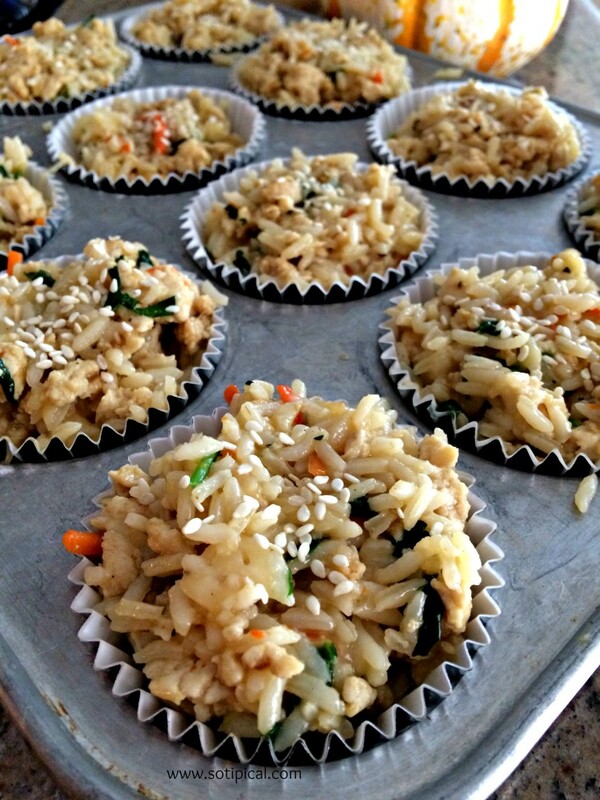 You can use anything you like or that you find in fried rice. It could be cabbage, peas, carrots, zucchini, mushrooms, spinach, etc. This day I used shredded carrots and I cut a big handful of spinach into ribbons. Then I mixed it with the chopped parsley and combined it in a large bowl with the rice, chicken, mozzarella and added fresh cracked pepper. In another bowl, I beat 3 eggs with the remaining sesame oil and soy sauce. 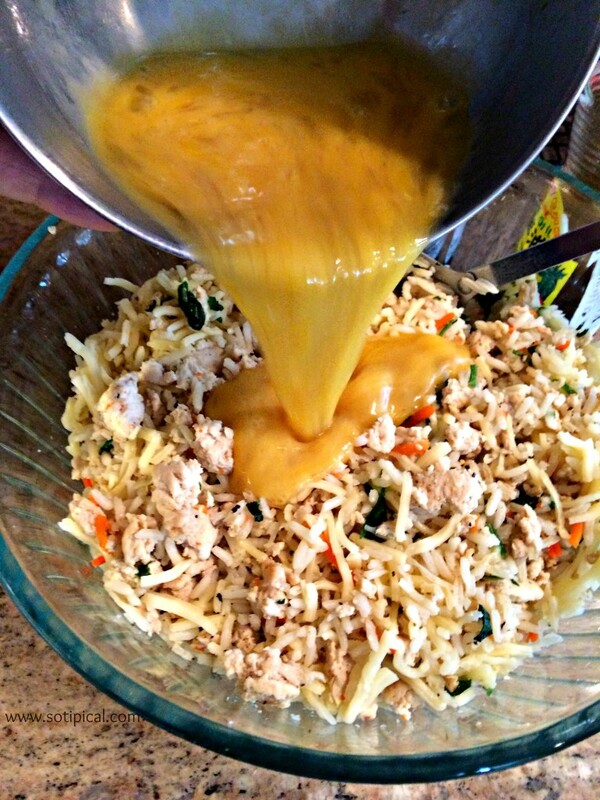 I poured it over the chicken and rice mixture until it was mixed well throughout. Line your muffin tin with cupcake liners. I prefer the foil ones when I bake with meat or egg. Divide the mixture evenly between the 12 cups. Sprinkle the tops with sesame seeds, if desired. Bake for 18-23 minutes. Check to make sure the egg is cooked through, then remove and set aside. You can serve immediately. If you are making ahead, allow to cool through at least 1/2-3/4 of the way through before refrigerating them. Store in an airtight container. And here you have it. 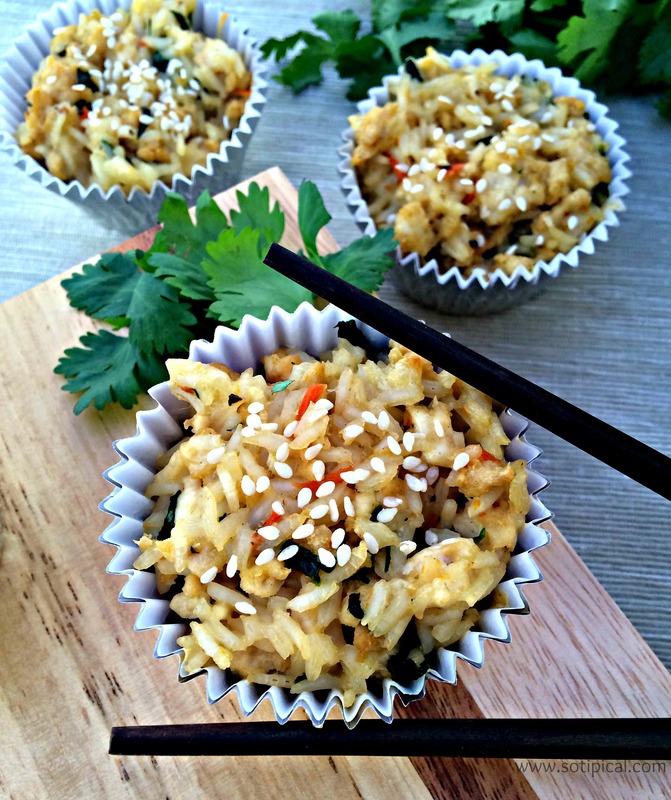 Chicken Fried Rice Cups! So yummy! My husband loved them too! We had some for lunch yesterday with a side salad. So good!